Microsoft wants Windows 10 users to use its Edge browser, and the company is pulling every trick out to make it happen. 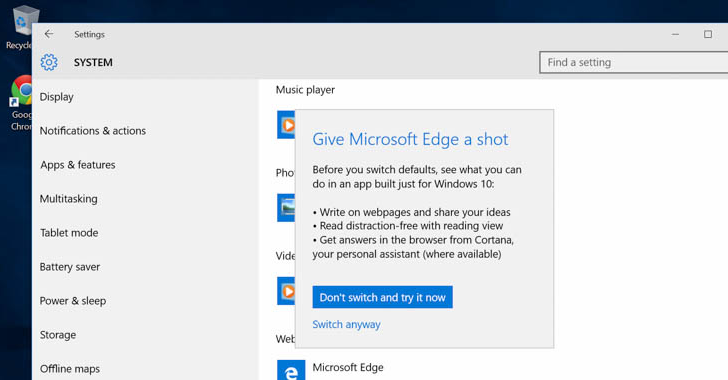 In a newly leaked Windows 10 preview release (build 10568), Microsoft has added a new prompt that appears whenever you try to switch away from default apps, including Microsoft Edge. Considering the wide adoption of Microsoft's newest operating system Windows 10, it seems that users are still hesitant in adopting Edge browser that comes bundled with Windows 10. To help encourage a higher adoption of Microsoft's default apps bundled with Windows 10, the software giant seems to be taking some steps. Come, Give Microsoft Edge A Shot! If you already have Microsoft Edge as your default browser, then installing another rival browser, such as Google Chrome or Mozilla Firefox, and switching the defaults will make a dialog box with "Give Microsoft Edge a shot" appear. Besides this, the new prompt has a big and bold "Don't switch and try now" button that, according to the company, indicates that the most prominent option is to stick with the Microsoft option. Microsoft wants to reach out its goal of deploying Windows 10 on over 1 Billion devices worldwide. So much desperate that last week the software giant made a mistake, which resulted in automatically installing Windows 10 on users' computers running Windows 7 and Windows 8/8.1, giving no option to users to cancel or opt-out of upgrading. It's not certain that this new prompt will reach the public Insider Preview program, but if it reaches, the change might irritate rival browser makers including Chrome and Firefox. The leaked information also made it clear that Microsoft is experimenting with ways to keep Windows 10 users to stick with its default apps, with Edge being one of them.